The Amphibian Ark has a number of very generous sponsors and corporate partners. But there are also, of course, many hundreds of community groups and people who are helping to support amphibian conservation in many ways, and their contributions are incredibly valued. There are many ways in which people support Amphibian Ark. Here are a few of them. The Amphibian Ark thanks you all! 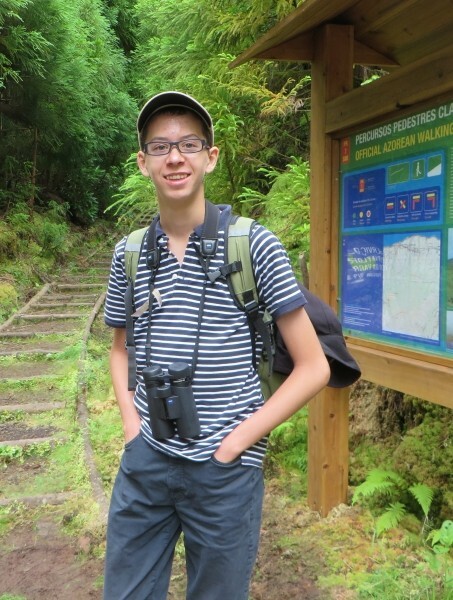 Amadeus – a conservation hero! Amadeus lives in the South of Germany, and is he an amphibian conservation hero. 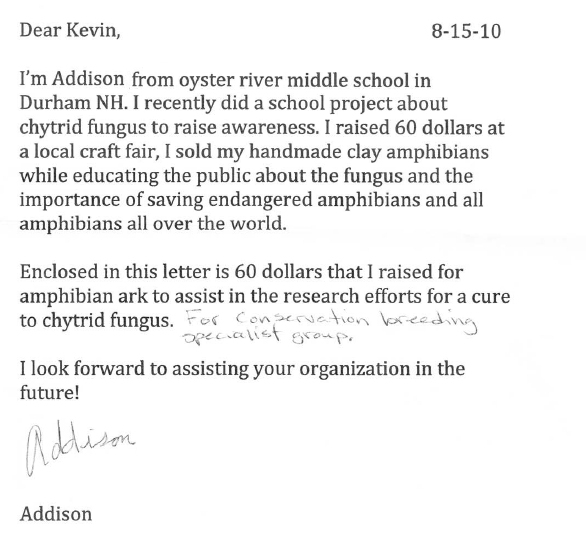 Several months ago Amadeus wrote to us saying that he wanted to donate his pocket money (a considerable sum) to help amphibians. Amadeus: “At the age of three I started my interests in amphibians when I watched the metamorphosis of a green frog in our garden pond. I was so fascinated that I wanted to know more about these animals”. Now fourteen years old, Amadeus has a small breeding program in his parents’ garden for yellow bellied toads. He reports that the program runs very well. Amadeus has seen all but two of the twenty species found in South Germany in the wild. Amadeus is concerned about the future of amphibians: “Amphibians play an important part in the ecosystem and they are good indicators of an intact ecosystem”, said Amadeus. He’s concerned because in his opinion most nature conservation organizations only care about large mammals and birds. Amadeus is a member of LARS, an organization that works to protect amphibians and reptiles, and LBV (Bavarian Society for the Protection of Birds), another conservation organization. He helps educate his classmates, some of whom are afraid of amphibians, by taking newts or tadpoles to school when he has to do a presentation. The Amphibian Ark salutes Amadeus as a young amphibian conservation hero. He helps us believe that there’s a brighter future for amphibians in the years ahead. Kait from Tremont Elementary School has donated $21 to the AArk after making rubber band bracelets and selling them – thanks Kait! Sam donates his birthday money again! Hope all is going well. Please, please keep doing what you’re doing and save the little guys. I think this is my third donation now and I’ll keeping giving what I can when I can. This money was raised from clearing out my room and selling stuff on eBay. Robert’s birthday party raises $90 to help AArk projects! Tremont Elementary School does it again! The second grade students at Tremont Elementary School in Upper Arlington, OH, just sent us a check for another $895! This money was raised from a recent read-a-thon and craft fair and this gift brings their total donation for the year to $1,596. 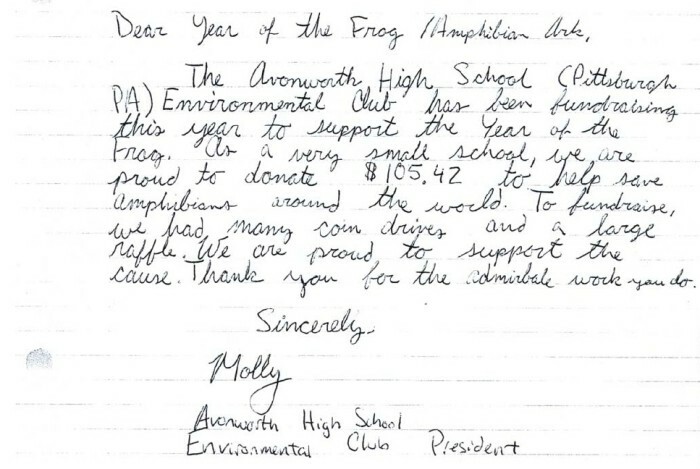 This is the third year that the second grade students have been raising funds to support amphibian conservation, and the total they have raised since 2008 is a HUGE $4,691! The children are very excited about their efforts, and rightly so! The parents are very supportive, and of course all of this is made possible by the on-going support from the second grade teachers at the school, Mrs Gordon and Mrs. Carlson. This is a massive effort on behalf of all of those people involved with the fundraising activities, and we thank you all. Second graders raise over $2,700! 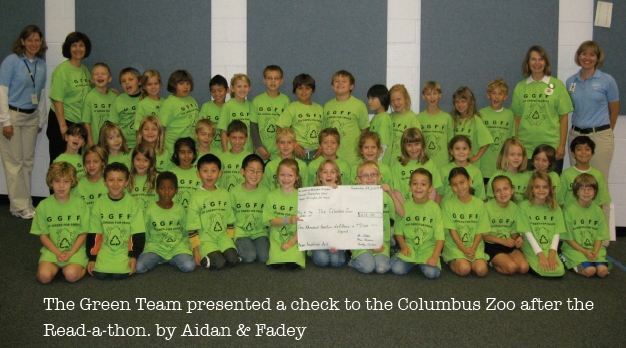 During 2008, second-grade students from Tremont Elementary School in Upper Arlington, Ohio donated $817.50 which they raised by holding a frog book read-a-thon. Earlier this year, Mrs. Gordon and Mrs. Carlson’s classes planned a bake sale at the school, and parents made dozens and dozens of frog cookies and cupcakes to sell. The two classes raised $340 more to donate to Amphibian Ark. In their next project, Art teachers helped them draw a design for a tote bag, and they sold 100 bags, raising $403 for the Amphibian Ark. The second graders raised the money for their most recent donation by holding a read-a-thon, and they have plans to hold a craft fair to raise even more money. The Tremont Elementary students have also created a GGFF (Go Green For Frogs) page online. 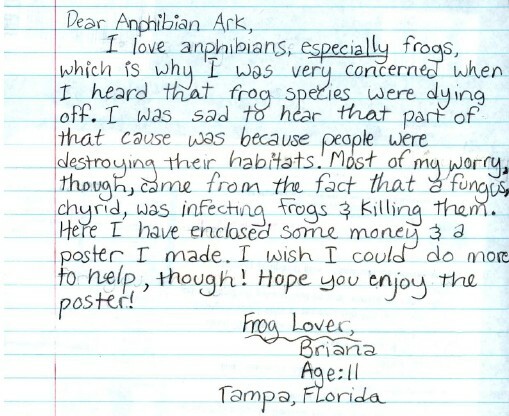 The Amphibian Ark truly appreciates the amazing efforts of the Tremont Elementary School students and teachers. My name is Sky and I am twelve years old. For the past five years I substituted presents for donations to wildlife conservation organizations. Every year I choose a different organization. This year I chose Amphibian Ark. I love reptiles and amphibians. When I went to the Amphibian Ark website and saw the great work you are doing I decided that I had to donate to this organization. I wrote in all of my birthday invitations that instead of presents i wanted to receive money, to donate to your organization. I ended up with a total of $200. Your organization is doing many great things such as how you are fighting to stop the spread of the disease chytridiomycosis, so it is a pleasure to see this money go to such worthwhile projects. 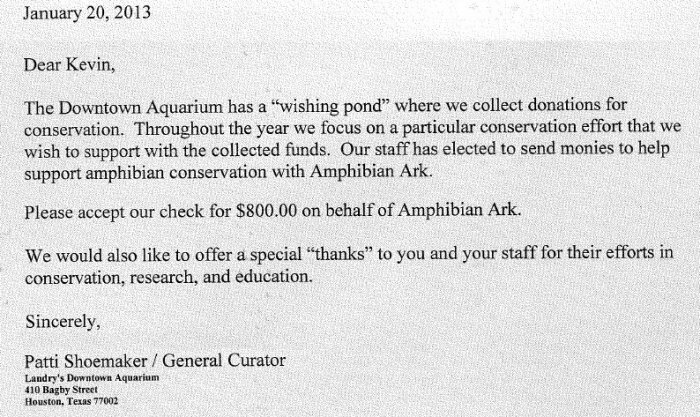 I like Amphibian Ark so much that I may very well donate to it again , in the future. Here is our donation to your project. We are an after school project made up of kids in kindergarten through sixth grade. The director of our program read about your project in National Geographic and suggested we use the last 5 Weeks before school ended here in Austin, Texas to raise money to donate. We agreed. We sold snow cones; we sold pop corn. We canvassed and solicited donations among friends and neighbors. (Many people were impressed with our knowledge of the critical situation!) One first grader made money the old fashioned way; she earned it… at her «Save the Frogs» Lemonade Stand! Yesterday we wrapped up our Five for Frogs! Project with a presentation in our clubhouse about the animals of our earth’s rainforests. Fellow Austinite Michael Hicks, the Zoo Man, who comes to our Child Craft Clubhouse regularly, is himself an amphibian expert and zoo curator. We turned over our pennies, nickels, dimes, quarters and paper money to our director today; she wrote a check to send to you. Good luck with your work for the frogs in the name of our planet! Coram Elementary School in the Longwood School District in Long Island, NY went «Green» this year to educate the students about the way they can help protect the Earth. 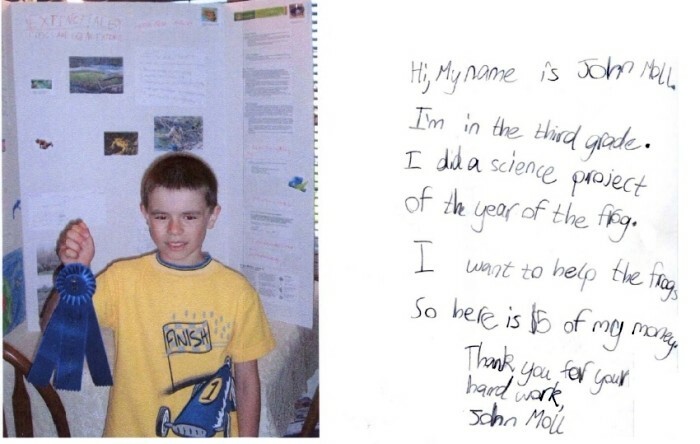 As part of a school wide curriculum project, the students from Kindergarten to Fourth Grade read and wrote stories, poems and letters about the Earth and created projects illustrating what they have learned. Hallways were decorated and parents were invited to a class celebration. 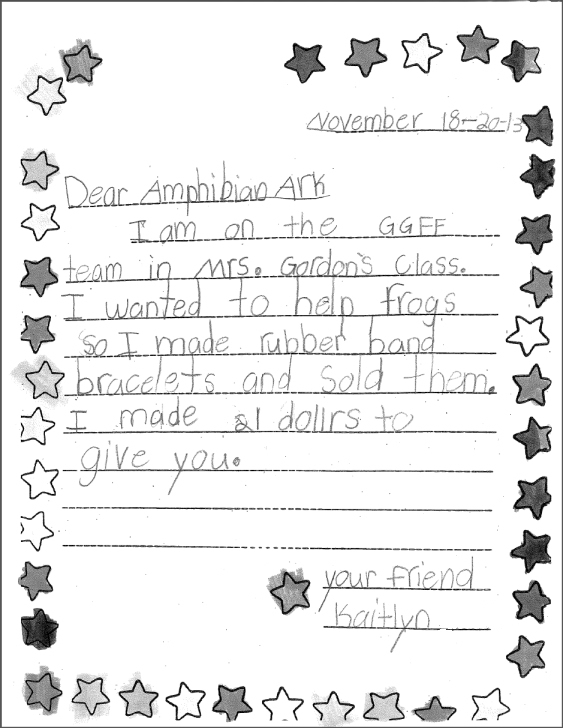 In Mrs. Oldenborg’s 4th grade class, the students got an opportunity to combine their study of frogs and toads with their desire to help the environment. Students read a poem that discussed how many species of amphibians are in danger of going extinct due to human’s effect on the environment. The students decided they wanted to help. They collected cans and bottles and recycled the to raise money. In addition they participated in National Leap-a-Thon Day on May 19th. 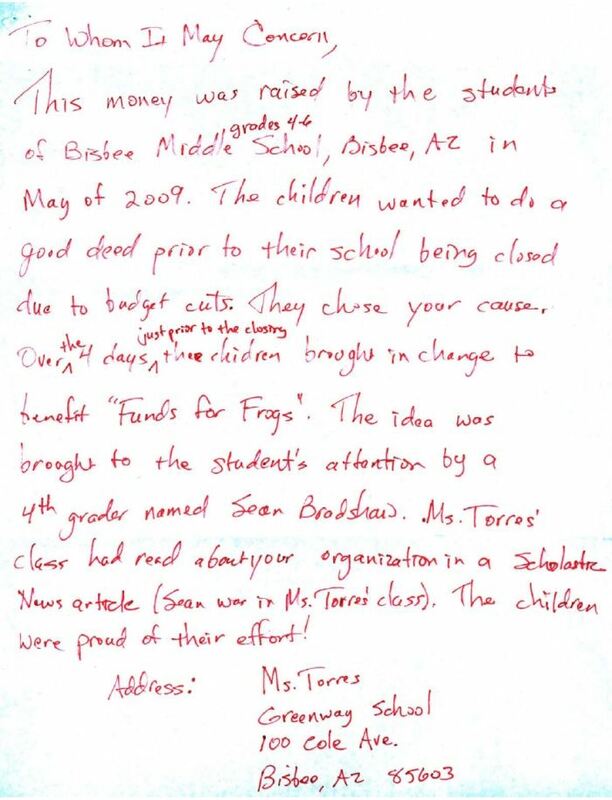 Students asked for donations from family and friends and «leaped» to help endangered frogs. The money raised will be donated to Amphibian Ark, a non-profit organization that is running a global campaign to raise awareness about these important animals. They deemed 2008 the «Year of the Frog» and are working to save 5 frog species from going extinct. Combined, the students were able to raise a total of $150! Mrs. Oldenborg is very proud of her students’ hard work and generosity. Children are our future and they must be the ones to make a difference. 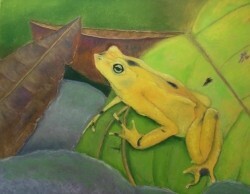 I am finally back from my trip to Panama where I had an exhibition with the Nature Conservation ONG there ANCON. It was very successful and even though I was not able to sell all four of the golden frogs (Atelopus various) I at least sold one. I had promised 10% to Amphibian Ark, therefore I will send your organization 50 euros and just hope the dollar goes up someday. Enclosed please find a check in the amount of $55 as a donation from our middle school to your wonderful organization! I am the art teacher at Williston Middle School, and every year my sixth grade students create ceramic frogs as an assignment. At the end of last year the sixth graders not only created their assigned frog, but they also made a small «extra» frog to sell as a fundraiser for Amphibian Ark. With the end of many school years being as hectic as they are, we are finally able to send our raised money! Those wonderful students who created the frogs are now seventh-graders – ready to finish this school year! Thanks for your hard work on the part of these wonderful creatures! 9-year old donates all his birthday gifts! 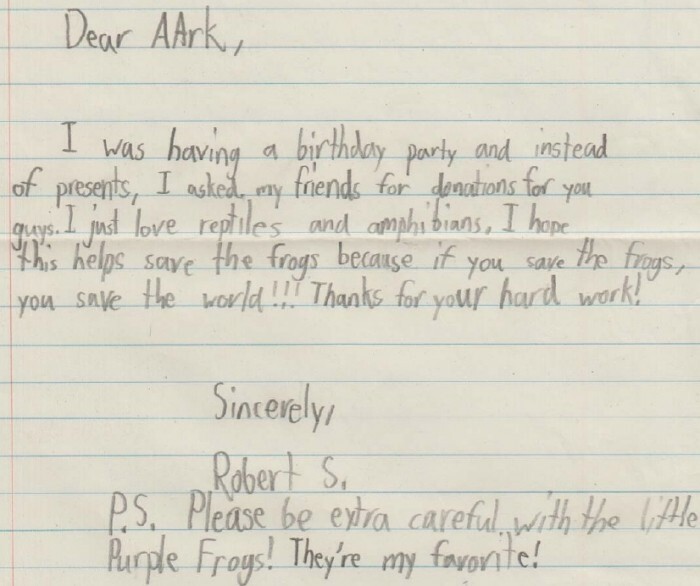 At his recent 9th birthday party, he asked his friends to donate to the frogs instead of buying him a birthday present. He collected $275 in cash and many other children said their parents had made a donation directly to the website (at least $70—but probably more!). All of his friends were very excited to help too. I have attached his letter requesting donations. 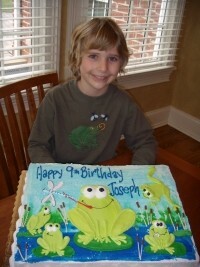 Joseph hopes that you are able to help a lot of frogs with this!! My daughter, Katherine, is requesting donations to your organization in lieu of gifts at her 11th birthday party. She is «frog-crazy» and mourning the recent loss of two pet frogs. She’s agreed to help frogs in nature, rather than keeping them as pets. Are there any special instructions we should provide the birthday guests? Also, are there items with your logo we could purchase to give the children as party favors? 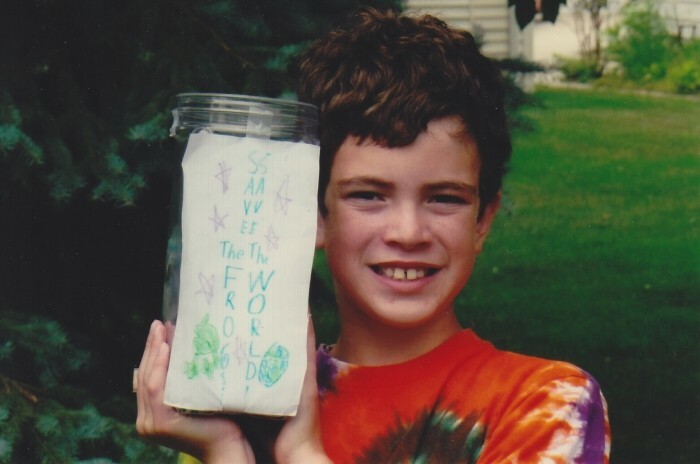 I am so proud of the passion he displays for the environment, and specifically amphibians. 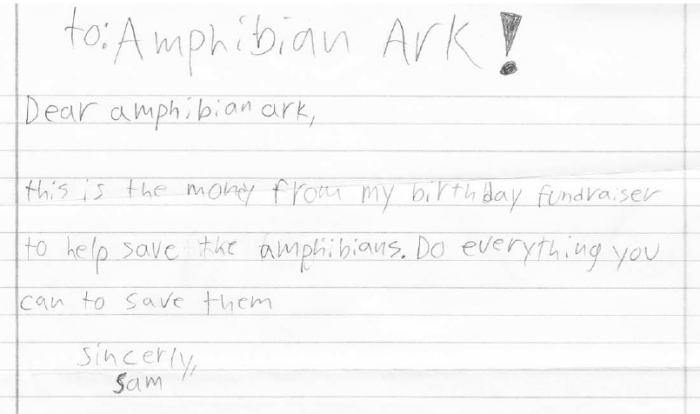 In addition to saving part of his weekly allowance, he decided that he wanted to accept donations for Amphibian Ark on his 8th birthday in lieu of gifts from his friends. At his birthday party he raised $195. Please accept this additional donation in Sage’s name. 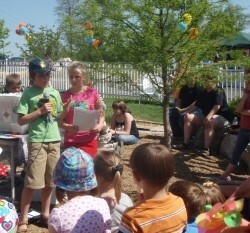 He was also one of the featured presenters during the dedication festivities for a new children’s garden in Saint Charles, Missouri. His topic was the life cycle of frogs and their habitat along with a showing of many frog and toad species of Missouri. 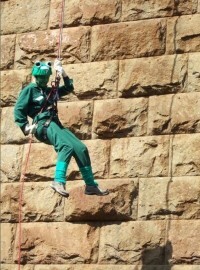 An Edinburgh Zoo worker abseiled from the Forth Bridge in Scotland, in April, dressed as a frog as part of a fundraising drive for the Year of the Frog. Polly Phillpot, the zoo’s senior education officer, descended 165 feet to raise cash for the EAZA (European Association of Zoos and Aquaria) 2008 Year of the Frog Campaign. Ms Phillpot said: «Amphibians play an important role in ecosystems and are essential environmental indicators for climate change, therefore holding great importance in scientific research. 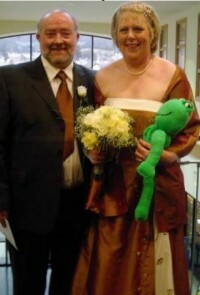 On Friday 29th February, 2008 Sue and Nick from the Isle of Man were married. 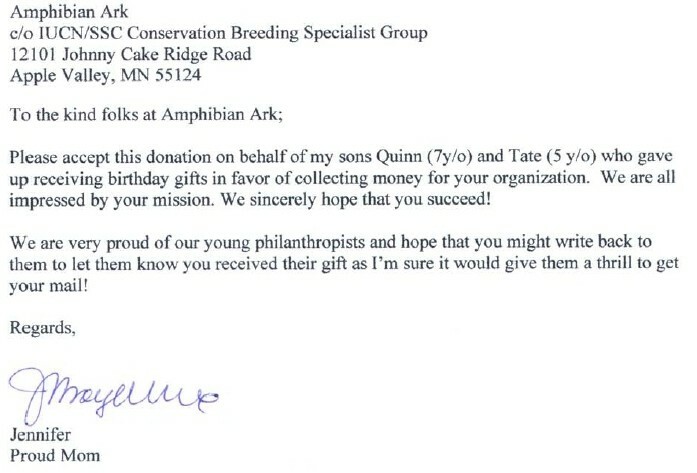 The newly-weds requested donations to Amphibian Ark in lieu of presents and raised approximately US$ 1,000. 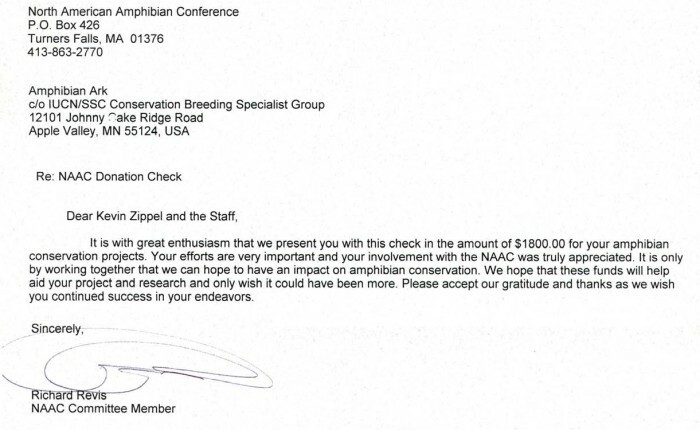 The Brookfield Chapter of American Association of Zoo Keepers would like to make a donation of $811. Part of our chapter’s mission is to encourage and support conservation efforts. We held a spaghetti dinner in honor of Amphibian Ark. The support from Brookfield Zoo and the surrounding community was very generous. We selected your organization because it is the year of the frog and we are aware of the current crisis facing amphibians. 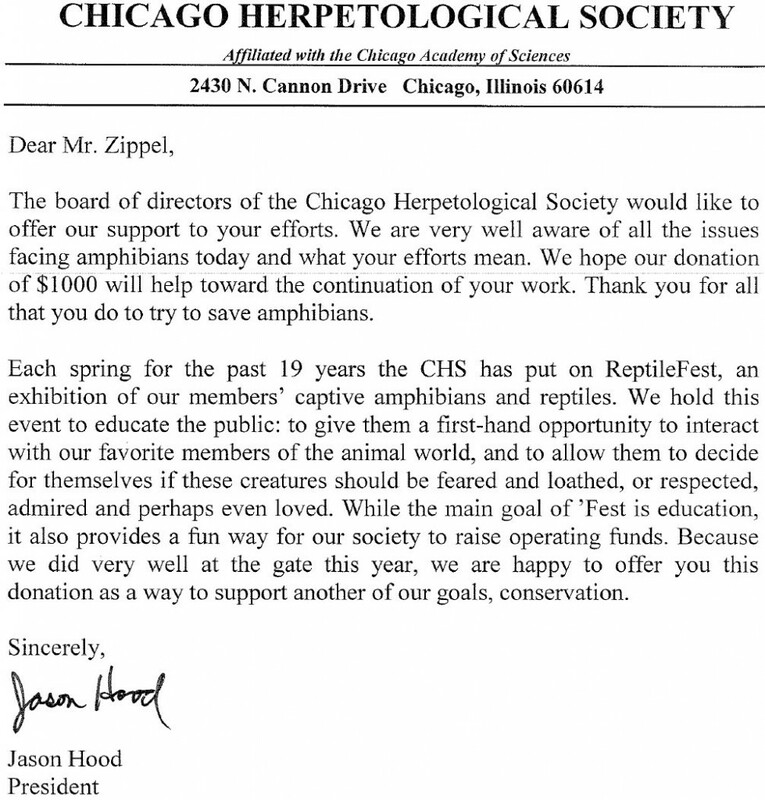 We hope our contribution will help support your effort to save the amphibians from extinction. Samara, a 12-year old girl from North Queensland in Australia, has started her own newsletter called Frog News. The newsletter is sent to local schools, frog groups, government departments, conservation groups, media etc. It is aimed a children but Samara is making sure that it is educational for adults as well as children. 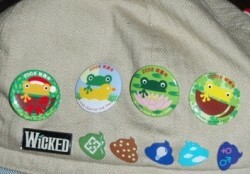 Taipei Zoological Foundation has developed a series of new badges for 2008 Year of the Frog, and these will be available in May. There are holiday versions and habitat versions; all of them are a transformation of the AArk logo. Holiday versions of the badges will include dragon boat festival (May 5th of the Chinese lunar year, June 8th 2008), Chinese valentine (July 7th of the Chinese lunar year, August 7th 2008), moon festival ( August 15th of the Chinese lunar year, September 14th 2008), Christmas and Chinese New Year, (January 26th 2009). We read about your project in News 2 You. After we read it we thought we should help you raise money to save the Wyoming Toad. We raised $63 by collecting pennies from students and teachers in our school. Good luck saving the amphibians! We currently ran a special on our website for the month of January. For every fruit fly culture we sold online we would donate $1.00 to Amphibian Ark. Attached are the order numbers and total cultures per order. The sale was not as successful as we had hoped, thus we are sending a little more. We hope this helps out with all the great research you are doing, as amphibian hobbyists we REALLY appreciate all the work. Thank You for all You are doing to help improve the Amphibian world! We are the staff of the student newspaper The Spectator at Forest Lodge Academy in Lake Forest IL. We are concerned about the plight of amphibians worldwide because of our school mascot. Our sports teams compete as «The Caxys» which is the Greek word for the sound that frogs make. We don’t want our mascot, not matter how silly, to become extinct. We wrote about the amphibian extinction crisis in the September edition of our newspaper. We also printed and sold tee-shirts to dramatize the situation to our student body. Our students responded to our money-raising campaign idea and purchased our shirts. As a result we are pleased to enclose a check for $428.95 as a donation to your work. Good luck in your efforts to save our Caxys!